The food or nourishment is any substance that can be consumed to provide nutritional support for the body. 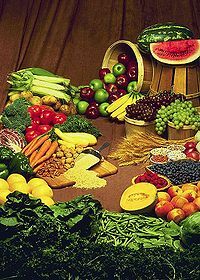 The foods contain one or more types of nutrients like carbohydrates fats proteins Vitamins and minerals. 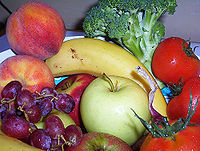 In general, this group of foods are fruits, vegetables, tubers, cereals and other grain products. In general, this group of foods are meat of mammals, birds and fish, eggs, milk and dairy products like cheese, and other dairy products. The foods of animal or vegetable origin contains essential nutrients such as carbohydrates, fats, proteins, vitamins, or minerals. Once ingested the substance by an organism they are assimilated by the body's cells in an effort to produce energy, maintain life, or stimulate growth. ↑ 1.0 1.1 Yeung, David L.;Laquatra, Idamarie, ed. (2003). Heinz Handbook of Nutrition (9th ed.). Heinz Corporate Research Center. p. 2-3. Library of Congress Catalog Card Number 95-076641. This page was last modified on 30 August 2012, at 16:53.